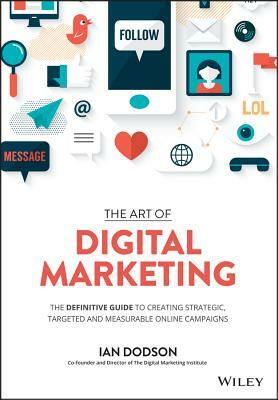 The Art of Digital Marketing is the comprehensive guide to cracking the digital marketing 'code, ' and reaching, engaging, and serving the empowered consumer. Based on the industry's leading certification from the Digital Marketing Institute (DMI), this book presents an innovative methodology for successful digital marketing: start with the customer and work backwards. A campaign is only effective as it is reflective of the consumer's wants, needs, preferences, and inclinations; the DMI framework provides structured, implementable, iterative direction for getting it right every time. The heart of the framework is a three-step process called the 3i Principles: Initiate, Iterate, and Integrate. This simple idea translates into higher engagement, real customer interaction, and multichannel campaigns that extend even into traditional marketing channels. IAN DODSON is Co-founder and Director of the Digital Marketing Institute. The Institute has defined a set of qualifications for the digital marketing industry which are now the most widely taught global certifications - available in over 70 countries worldwide. These qualifications act as an educational and professional pathway for students, educators and employers. Passionate about student centric outcomes and an advocate of education and digital literacy, Ian believes digital technologies are enabling tools for raising economic and social standards globally.